The Basque Country is the culinary center of the world. Not only for its many gastronomical temples—like Martín Berasategui, Arzak, Zuberoa, or Azurmendi—but for the infinite amount of places where they prepare amazing plates—and pintxos. The Inglorious Basque-ard Burger is Pornburger's homage to the latter. 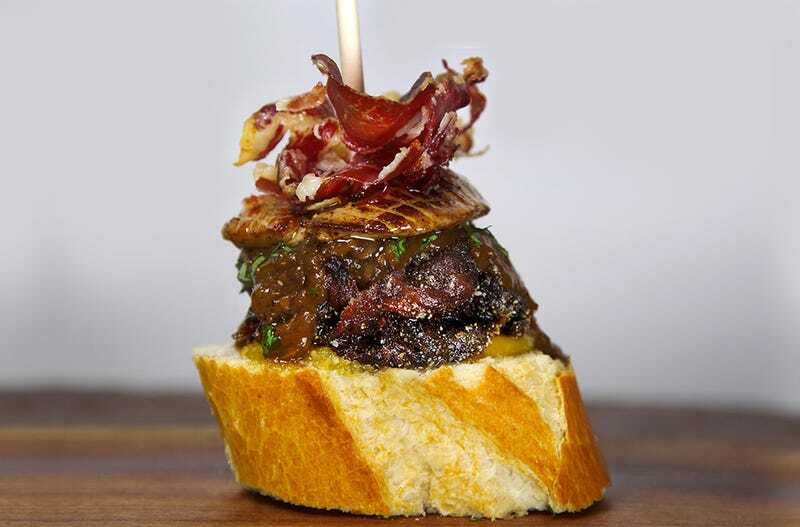 Braised oxtail burger comes served in it's own sherry fortified jus, topped with seared foie gras, candied Jamón Ibérico, and skewered to a crispy slice of country bread lathered in a roast physalis, shallot compote. I can perfectly imagine how this tastes and, since I'm in Madrid on vacation right now, I'm going to make it myself as soon as humanly possible.